I’m seeing red, white, and pink wine that is. The bottles are stacked in the fridge and I am trying to figure out what seems most discerning to my palate this evening. As I stand there fridge wide open and bottles stacked staring back at me, the next thought crosses my mind is how easy uncorking is going to be. I bet you are thinking un-corking is never easy. How many times have you used a corkscrew that went in wrong, got caught, messed the cork or better yet put cork pieces into to your bottle. Then of course it becomes cheesecloth time or very fine strainer moments where you look like a wine-obsessed person twisting all the possible wine through the cloth or strainer letting no drops going un-drank. I have lavishly been living wine opening with a great wine opener. 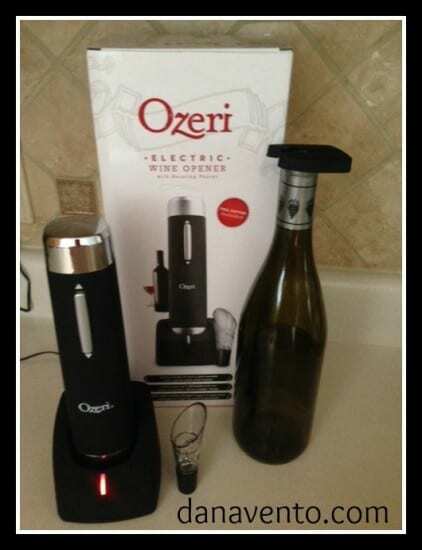 The wine bottle is waiting for you and the Ozeri Electric Wine Opener is waiting to be used. Decked out with an ergonomic soft grip, and easy push down & up button that controls the cork removal, and a removable foil cutter, all leading the best options on a basic electric wine opener. The base is for charging via electric and the LED Charging light indicator gives you a green for uncorking time when the unit is ready to use. First, the foil around the cork is real pretty and official but seriously, it is the most time consuming part of bottle opening right? Like a kid in the candy shop, waiting for that first glass of wine takes too much time. The first smell of the grapes making their way up the neck of the bottle, it’s all so intense and moments can seem like minutes. Rapidly remove the foil with the a foil cutter that is included, making it one step easy and the result is a nice clean cut every time, no knife, no peeling and getting stabbed under the fingernail by that pesky foil. I have used so many wine openers over the last few years and by far this one supersedes in the easy to use component. If your unit is charged and the light is green for go, un-cork that cork baby and let the wine flow freely. All you have to do is hold the bottle with one hand, while holding the electric wine opener with the other hand, keeping the bottle steady and still, push down on the button and the cork is removed, now push the up part of the button and the cork is backed out~ Woot Wine Time! Just in case you are wondering, the charged opener will open the bottle in just seconds and a single charge offers you the ability to open about 80 bottles with the touch of ONE button. Oh I predict a wine opening and sampling party! As an added bonus the Electric Wine Opener offers an aerating pourer which is dead on spot for pouring, I really love this pourer as it creates a professional looking pour each time. You to can lavishly live wine bottle opening if you have an electric wine opener. This has worked for several bottles so far(15) without needing a charge, and we have used it on normal corks without any challenges. Get ready to start the wine party and let it flow once you open the bottle with ease, because an electric wine opener makes it possible. *product was provided to facilitate review. Do not consume alcohol unless you are of legal drinking age, don’t drink and drive and if you are pregnant you should not consume alcohol.